One of the most constantly evolving and frequently cutting edge areas of technology and innovation is gaming. Whether that’s pushing compute to the limit with the latest first person shooter, or ever-more-real virtual worlds, gaming leads the way. Since many games use similar features regularly, game engines are used to speed development – for example, many games require some kind of physics engine, rendering capabilities and interactive elements. Using a game engine such as Unreal Engine 4 allows developers to create much more quickly by using these common elements. Game engines are also increasingly being used for non-game creation – the ease of cross platform creation, real-time rendering and the focus on interactivity mean that engines like Unreal are being used to create apps, films and many different types of interactive content. With support for Intel® RealSense™ Technologies, whole new types of interactivity become easier to develop. A depth camera provides a stream of information that can be used in a variety of ways. In real time, pixels of both color (RGB) and depth (distance from camera) are provided to the game engine. One of the ways this can be used is as a touchless controller – since you have positional data from the camera, you can track people or objects in a variety of ways, for example, tracking the movement of hands in front of the device. Depth cameras can also be used for skeletal tracking, enabling active games or more physical interactions. Interaction is not the only use for depth cameras within gaming; depth cameras can be used to quickly create 3D scans of real objects, environments or people for use as game assets. Check out our 3D scanning software offerings here. These assets can then be brought into Unreal and used in whatever way makes sense for your application – how about scanning people and using them to create unique in-game rewards like statues or trophies? These are just a few examples of use cases for Intel® RealSense™ Depth Cameras within game engines, though there are many more – since depth cameras can give highly accurate measurements of real world objects and environments, they can be used to create furniture-placing or interior decorating applications, again with the assistance of a game engine like Unreal. 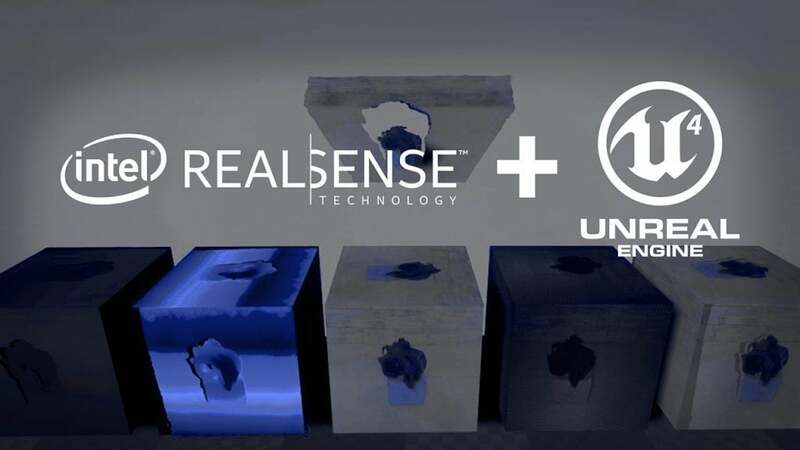 Get Started – To get started with Unreal Engine 4 and Intel® RealSense™ Technology, please check out our Github.